Today I finished by current Bible reading plan by reading the last few chapters of Revelation. Tomorrow I will begin again in Genesis. As I read about the final confrontation between Christ and the Antichrist, I was struck by how unequal the battle was. The biggest part of Revelation alternates between scenes in heaven and on earth. It describes God’s judgment, as well as the seemingly unstoppable power of the beast (i.e. the Antichrist). 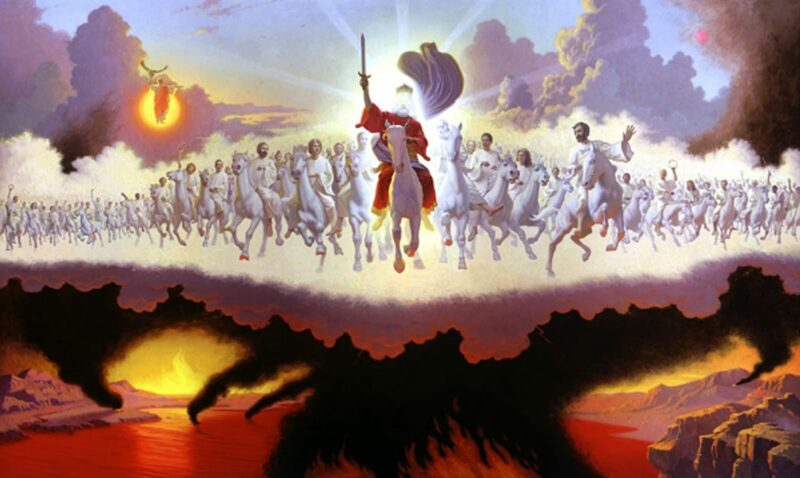 In the climax, in chapter 19, Christ appears in all his glory on a white horse, along with the armies of heaven (Rev. 19:11-16). On the other side, the beast and the kings of the earth have gathered a tremendous army to fight the heavenly invaders (v. 19). The scene is set for an epic battle. If this was a movie, we would expect a long, drawn out battle scene, with plenty of special effects. But that is not what happens. In the very next verse, the beast and the false prophet are captured and thrown into the lake of fire, and then the following verse describes the complete destruction of their army (vs.20-21). The battle is over before it begins. There was never any question about the outcome. I assume that the beast and the false prophet must be deceived into thinking that they could somehow succeed in their fight against Christ. After a short period of almost absolute control of the earth, maybe they thought it could continue indefinitely. Probably a lot of people came to the conclusion that nothing could stop them. But they were wrong. Sometimes evil seems unstoppable. It was like that when this was written, near the end of the first century. Although the gospel was spreading, systematic persecution was on the rise. Who could stand against the power of the Roman Empire? How could the church survive? By revealing the end of the story, God assured his people that he was still in control, and that in the end evil would be defeated. There is no question about the outcome. There are times when we might need the same encouragement. Sometimes evil seems unstoppable. Sometimes we feel like David facing Goliath, and unlike David, we are not too sure what will happen. But God is still on the throne. In God’s perfect timing, Christ will come to establish his kingdom on the earth. Nothing can stop him.